Where is your Class Calender? What is "Loyalty Rewards Program"? When you Shop at Hi Fashion Sewing Machines you will receive a discount on all your supplies that you purchase. Ask a sales associate for more information on this Loyalty Rewards Program! 1. Pre-registration and payment required to hold space in class. 2. No refunds if student cancels less than seven days prior to class start date. No refunds are given for classes missed. 3. Full refund will be made if class is cancelled by Hi Fashion. A full week’s notice will be given. 4. A student is expected to have all required supplies as per class supply list prior to first session of class. A 10% discount will be given for regular price supplies purchased for class. 5. Supplies purchased for a cancelled class may be returned as long as they were not cut items. Receipt required. 6. Please make arrangements for your children. 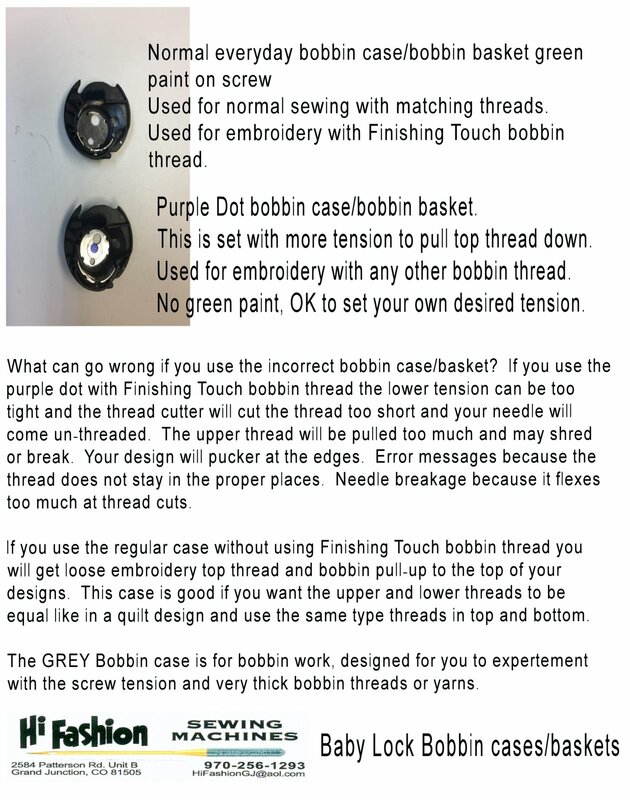 Which Bobbin Case do I Use in my Baby Lock? There are different times and situations that you would use one or the other, CLICK HERE and you will see Jeff's answer. How Do I Oil My Bernina? Video can be found HERE or under Helpful Video tab along the top.